Hard, harder, Norwegian gneiss. With compressive strength of up to 300 megapascals, Scandinavian rock is regarded worldwide as the ultimate test of mechanized tunnelling technology. International construction companies trust in Herrenknecht's technology for this complex challenge. The global market leader from Schwanau looks back at decades of experience in tunnelling through the toughest of hard rock: Herrenknecht hard rock machines have excavated around 820 kilometers of tunnels in more than 200 projects since the year 2000. In late August the breakthrough of the Ulriken Tunnel for the expansion of the Norwegian railway network added another hard rock highlight to the list. 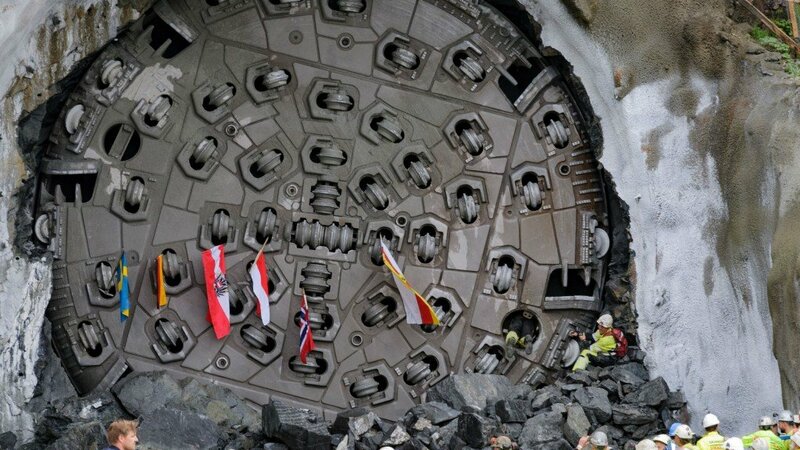 The railway tunnel through the Ulriken mountain is the first major traffic project in Norway to be realized with a Gripper TBM. On the west coast of Norway, the hard rock machine "Ulrikke" (Ø 9,300 mm) has bitten its way through extremely tough rock meter by meter in recent months. The miners of the "Skanska Strabag Ulriken ANS" joint venture have driven the 6.9 kilometer long tunnel between the cities of Bergen and Arna with excellent top advance rates of up to 170 meters per week. In Norway, drill & blast tunnelling traditionally dominates. "The realization that mechanical tunnelling is a real alternative even in the extremely hard rock now seems to be spreading in Scandinavia," says Eric Fourchault, Project Manager at Herrenknecht. Compared to traditional drill & blast, mechanized tunnelling has a number of advantages. It has less impact on the mountain and provides highest safety for the crew, without the shocks of blasting. The short distance of only 30 meters from the existing operational railway tunnel was therefore decisive for the use of a TBM at the Ulriken Tunnel. Furthermore, machine technology can achieve higher average advance rates, especially over long distances. TBMs are already being preferred over the traditional drill & blast method in other Norwegian tunnel projects. For Norway's latest large-scale infrastructure project, the "Follo Line" in Oslo, four Double Shield TBMs (Ø 9,900 mm) from Herrenknecht are creating the country's longest railway tunnel. In 15 months of excavation, more than 19 kilometers of the approximately 38 kilometer long total route have meanwhile been driven as a tunnel.